July 12, 2016, 7:00 P.M.
Official Selection: Sundance Film Festival 2106; Tribeca Film Festival 2016. In Theatres on Friday, July 29th, 2016. A female investment banker, fighting to rise to the top of the corporate ladder at a competitive Wall Street firm, navigates a controversial tech IPO in the post-financial crisis world, where loyalties are suspect, regulations are tight, but pressure to bring in “big money” remains high. Equity is about women on Wall Street. It’s a Wall Street drama, but it’s not about corruption, crime, or catastrophe. It’s about women who thrive on competition and ambition, deals and strategy, but who must carefully calibrate every aspect of their lives, professional and private, to stay equal in the game. 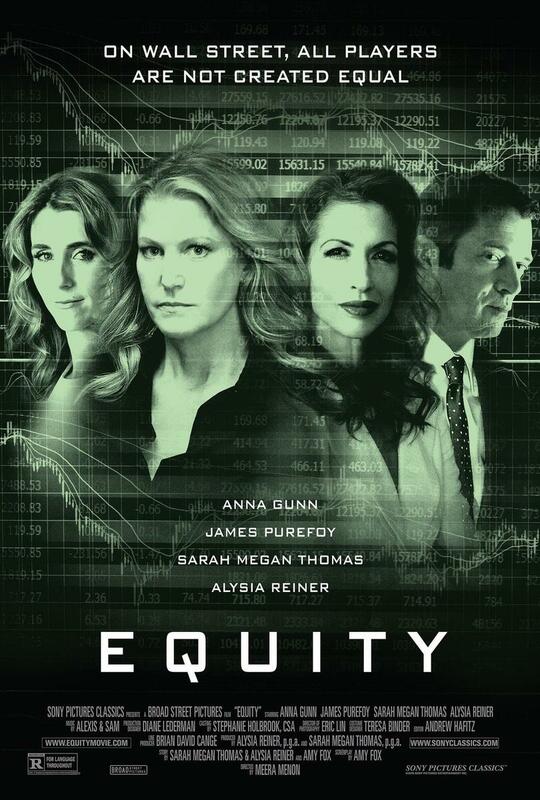 Equity is directed, written, produced, and financed by women, a collaboration among women in entertainment and business leaders in finance — the real-life women of Wall Street — who chose to invest in this film because they wanted to see their story told. Provided courtesy of Sony Pictures Classics. Rated R. Running time: 100 minutes. Meera Menon was recently selected to be a fellow at 20th Century Fox's Global Directors initiative. Her directorial debut Farrah Goes Bang premiered at the Tribeca Film Festival, where Meera was awarded the Nora Ephron Prize for a groundbreaking woman filmmaker by Tribeca Film Festival and Vogue Magazine. Additionally, Meera was selected by Glamour Magazine as one of 35 women under 35 Running Hollywood. She received her MFA from USC.